Simon is an accomplished business and technology professional who has worked in the Financial Market Data and IT industries for over 25 years. He has a proven record of delivering results in global business and product strategy, development, architecture, and the implementation of sales, support and marketing strategies regionally and globally. A proactive team leader in planning and implementation of innovative solutions, he has a unique combination of experience in both the business strategy and technologies involved with launching and supporting successful solutions. Before joining Sublime, Simon worked with BGC Partners a leading global brokerage company servicing the wholesale financial markets. Initially heading up IT Infrastructure/operations for Asia region, before moving into selling high-level enterprise OTC market data solutions. In 2005, Simon managed globally the direction of a cutting edge real-time market data desktop that had over a 100,000 end-users for Telerate. In this very customer focused role, Simon was able to bridge the gap between senior business and technology management in selling complex technology solutions, based on business benefits to non-technical users. 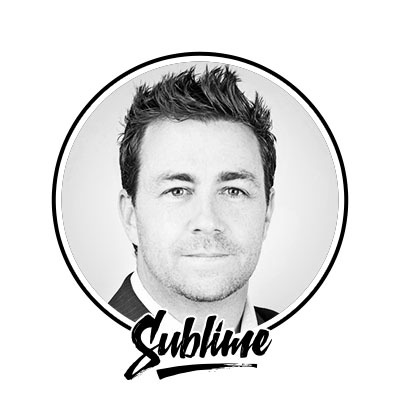 As the Sales & Account Director for Sublime, it is Simon’s role to manage existing customer relationships; assist them in optimising their technology investments, and work with them to find new ways of exploiting mobile technology to help them work better. Kim Grantham career maps the course of digital media evolution, from the early days of enhanced interactive CDs and touch screen Kiosks to the current growth of streaming rich media and mobile technologies. Kim brings 20 years’ digital design and development experience to his current role as Creative & Marketing Director at Sublime. He co-founded the award-winning mobile design and development agency Alive before that, Sydney based creative marketing agency Emotion and mobile game studio Squish. He also set up the first Australian offshore digital production and support company Engine in Cebu. His notable clients include Toyota Australia, Disney Japan, Warner Music, Sony Music, Telstra, Optus, Eftpos and the Australian Government. Kim has designed, developed and licensed several proprietary business software systems including an Email Marketing System, Content Management System, Digital Campaign Management System, Recruitment Syndication System & several Game Engines. Other experience includes ‘Production and Technology Consultant’ in Singapore, where he setup a new creative studio, working with cutting-edge technology to develop innovative online marketing solutions. During this role, Kim was invited by the Singaporean Government to lecture at the Nan Yang Polytechnic and judge the first annual national rich new media awards. Before that, Kim consulted in Los Angeles building an impressive client list including Universal Pictures, Warner Brother Studios, DC Comics and Def Jam Records by applying his skills directing online interactive 3D multi-path movies and showcasing the technology at Siggraph and E3 (Electronic Entertainment Expo). He was also instrumental in setting up Australia’s’ first motion capture animation facility in Alexandria. Kim studied Industrial Design & Psychology at the University of New South Wales. He is an active member of AIMIA, the Digital Industry Association of Australia, ADMA (Australian Digital Marketing Association), the CEO Institute and is also a certified partner of Hubspot and the Apple Consultants Network.